Soil pH is a measure of soil acidity or alkalinity and is an important indicator of soil health. It affects plant productivity, plant nutrient availability, and soil micro-organism activity which influence key soil processes. The acidity or alkalinity in soils have several different sources. 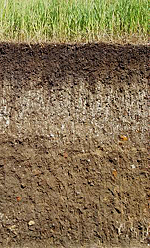 In natural soils, the pH is affected by the minerals in the geologic rocks or parent material, climate, and weathering. Before preparing the soil for planting it is very important to check the pH or “Reaction” of the soil. In addition, since many gardeners alter the soil pH to meet the requirements of their specific plants it is a good practice to monitor the pH twice a year, once in the spring and once in the fall. These seasonal pH readings are an accurate range over the entire year. Many people routinely lime their lawns, which can result in raising the pH too high. However, since many fertilizers tend to lower the acidity, the pH may drop below desirable levels after several years even with the annual addition of lime. When collecting soil samples for testing, it’s important to identify on your garden site plan the locations where you obtained these samples, and record the date and test results in your garden journal. See also Karen’s tip Soil fertility and texture; how and why to test your soil for garden success. Your garden soil can be naturally acidic, neutral, or alkaline. The pH scale (0-14) is actually a measure of the percent concentration of hydrogen ions and hydroxyl ions in the soil. A reading of 7.0 is considered neutral, readings below 7.0 indicate acid conditions, and readings above 7.0 indicate alkaline conditions (the U.S Department of Agriculture considers 6.6 – 7.3 a neutral range). This scale has another very important characteristic; it is logarithmic, which means each increment is ten times greater or lower than the increment before or after it. For example, a pH of 7 is 10 times greater than a pH of 6, and 100 times greater than a pH of 5. When soils are very acidic, elements such as aluminum and manganese become overly available and may become toxic to plants. Soils that are too alkaline may limit the availability of elements such as iron, zinc, copper, and boron, leading to nutrient deficiencies. In addition, plants have different pH requirements. For example, Azaleas require a pH of 4.5-6.0, Blueflag Iris 5.5-7.5, and Lilac 6.5-8.0. When soil pH levels differ from those required by a plant, nutrients may be abundant in the soil, but the plant cannot make use of them. 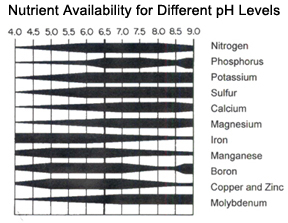 See Table 3 below for pH requirements of a wide variety of garden plants. Determining whether your garden soil is acidic, neutral, or alkaline will tell you whether or not nutrients are available to your plants. You can identify your soil pH with a simple soil test. Step one is to collect soil samples with a clean coring tool, trowel or shovel. For each sample dig a small hole 6 to 8 inches deep, then take a thin slice along the side of the hole that yields approximately one cup of soil. Collect soil samples from different garden areas (e.g., vegetable garden, Iris bed and lawn) and especially where the topography and growing conditions vary. Step two is to test the soil samples. Mix each sample in a clean bucket or glass bowl to make an homogeneous mixture. 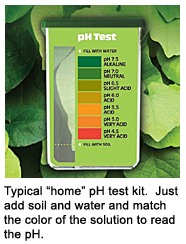 You can use an inexpensive “home” pH test kit yourself (Basic pH soil test kits are available from Amazon.com ) or contact you local county agent to see if they will test your samples for you. Analog and digital direct reading pH meters are also available, but they are more expensive and better suited for professional use by a soil scientist. The majority of garden trees, shrubs, and herbaceous plants prefer a neutral pH (6.5 – 7.0) soil. However, it’s best to choose garden plants that are well suited for the natural conditions of your soil to minimize your work in the future and have healthy plants year after year.